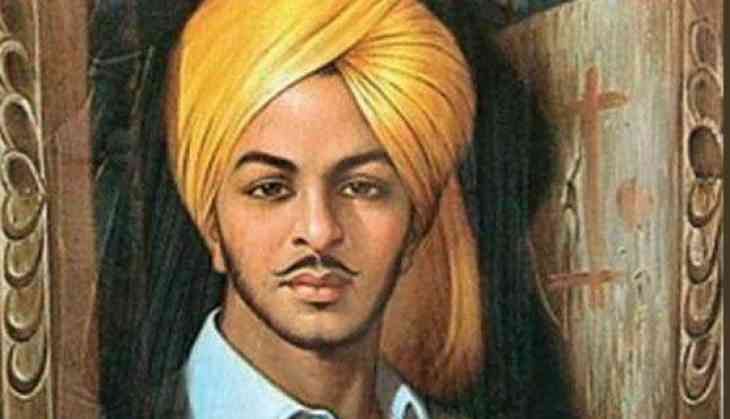 Freedom fighter Bhagat Singh's 87th death anniversary was observed here by two groups of people who demanded to declare him a "national hero" of Pakistan. Singh was hanged at the age of 23 in Lahore on March 23, 1931, along with Rajguru and Sukhdev. The capital punishment had inspired thousands of people to take up the cause of the freedom movement. The Bhagat Singh Memorial Foundation (BSMF) and the Bhagat Singh Foundation Pakistan (BSFP) yesterday held separate functions at Shadman Chowk where the three were hanged. The participants paid rich tribute to the three freedom fighters. Some relatives of Singh made a telephonic address. BSMF Chairman Imtiaz Rashid presented a resolution demanding the British Queen to tender an apology for hanging the three freedom fighters and compensate their families. He demanded to name a road after his name and including a chapter in the school curriculum besides issuing a postal ticket and installation of Singh's statue at Shadman Chowk. BSFP Founder President Abdullah Malik said: "Bhagat Singh raised his voice against imperialism. He will be remembered as a great freedom fighter". He demanded that the governments of India and Pakistan declare Singh and his comrades as "national heroes". The events were held under strict security in the face of threats from extremists. Both the foundations have been demanding to rename the Shadman Chowk as 'Bhagat Singh Chowk'. However, the Hurmat-e-Rasool, a sister organisation of Mumbai terror attack mastermind Hafiz Saeed-led Jamaat-u-Dawah, opposes the proposal and suggests to rename it as 'Hurmat Chowk'.